! THE ONLY REAL ROYAL & NOBLE TITLES READILY AVAILABLE IN THE WORLD TODAY ! His Imperial Majesty is one of only two Imperial Kings (Emperors) on Earth. In or around July 2014, His Imperial Majesty King Roman Imperial Majesty King Roman I, Imperial King (Emperor) of Europa and Grand Duke of Lithuania, advised the Secretary-General of the United Nations General Assembly (UNGA) of his rightful inheritance, genealogical and legal, and his Royal Sovereignty of Lithuania, Belarus, Ukraine, Moldova, and Latvia (Courland-Livonia). His Majesty King Roman offers real titles, royal and noble, to raise funds for his Royal Projects (see below in red). 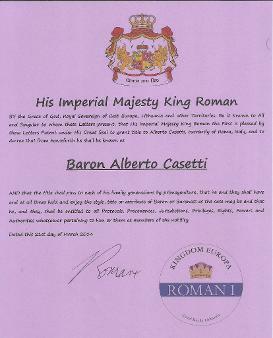 King Roman grants of real territorial titles of Royalty and Nobility are by letters patent on A3 parchment-style. These royal and noble territorial titles constitute a family legacy for the donor, and pass from generation to generation. Should you wish to help His Majesty's causes, as well as to receive a real noble or royal territorial title as well, then read on. 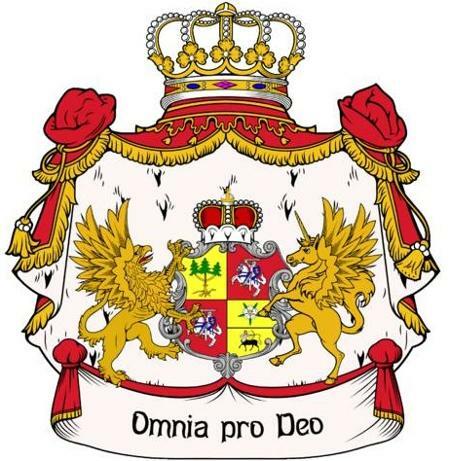 A real territorial title from King Roman makes you a genuine member of the East European aristocracy, with all the dignities, rights and precedences this entails. Your family will share in the blessings and benefits and inherit your legacy. 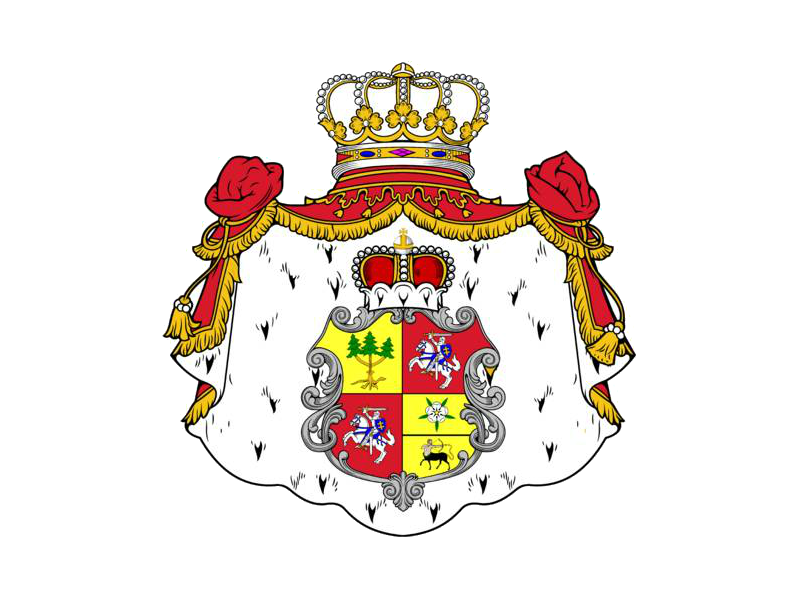 King Roman can accomplish these things for you because he is an imperial king, with a long list of legal accrual of royal titles that belong to the Grand Duchy of Lithuania and thus to him personally as Lithuania's Royal Sovereign. Donations for desired titles are used support His Imperial Majesty's Monarchy-in-Exile and further his royal causes, including full recognition of his legitimacy as King of Europa and Grand Duke of Lithuania etcetera, building and maintenance of his Castle/Palace long overdue, construction of his saucer-style spaceship (google Moonship Phoenix for info), helping our poor starving brothers and sisters of the world, and filming his books The Last Symbol, Moon Shock, and The Casebook of Sir Sherlock Holmes. You may upgrade your title ONCE at any time by donating the difference, and keep your former title as well! Letters patent are on A3 parchment-style, except for King/Queen which are on A2. 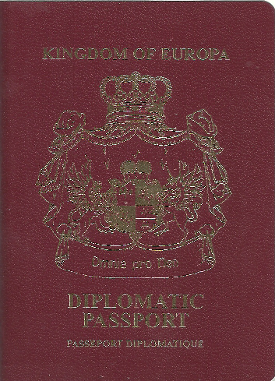 You will also receive a FREE Coat of Arms, plus a FREE Diplomatic Passport as an Ambassador for the Kingdom. GRAB THIS ONCE IN A LIFETIME OPPORTUNITY: ENSURE YOUR OWN FAMILY LEGACY NOW! Payment of your donation should be made by cheque/bank cheque as appropriate to King Roman, PO Box 42331, Casuarina NT 0811, Australia. New Grants of Noble title are real titles provided by letters patent, on A3 parchment-style, from the same real King Roman, and go to fund His Majesty's special activities. Payment may be made securely below through PayPal, or sent to King Roman, PO Box 42331, Casuarina NT 0811, Australia. 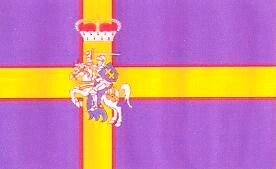 His Imperial Majesty is in the unique position of having a number of Empires and Kingdoms beyond Earth. If this has special interest for you, please visit www.MoonTitles.com now.